Angel Stadium of Anaheim is home for the Los Angeles Angels. The ballpark was also home for the Los Angeles Rams at one point before they moved to Saint Louis. 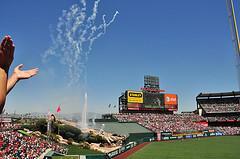 Angel Stadium is the fourth oldest Major League Baseball (MLB) stadium. It hosted the first televised MLB All-Star Game in 1967 and again in 2010. It also holds special events such as Billy Graham crusades, high school and college football games, and big-act musical concerts. Hollywood has shot a number of movies in the stadium including the remake of "Angels in the Outfield," "The Fan" and one of the "Air Bud" movies. The Angels held the groundbreaking ceremony for Anaheim Stadium (as it was called then) in 1964 on about 160 acres of land that used to be agricultural land. 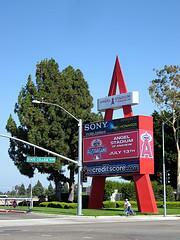 Anaheim Stadium is situated in a suburban area, like most ballparks, with tourist attractions located nearby. The California Angels (Los Angeles Angels now) moved in to the stadium in 1966. The Angels tried to scientifically size the field so it played the same for hitters and pitchers. The Angels tinkered with the dimensions of the field to achieve the right balance. None of this seemed to matter to their Hall of Fame pitcher Nolan Ryan who threw 2,416 of his career strikeouts (which numbered 5,714) and 2 of his 7 no-hitters in this stadium. Late in the 1970s, the Los Angeles Rams brokered a deal to move the Rams from Los Angeles to an expanded version of the Anaheim Stadium. The Angels added about 23,000 more seats for the football games, extended the upper decks and mezzanine completely around the field, built another bank of seats in left field, and enclosed the stadium. In the end, they lost the view of the mountains and the highway. Additionally, they moved the "Big A" to the parking lot where it still stands. They replaced the "Big A" with a Sony Jumbotron color video board in 1988. The fans of the Los Angeles Angels did not like the changes though. Before the changes, no seat sat further than 109 feet from the field. With the changes, most of the new center field seats were too far from the action. The expanded seating capacity was nice for revenues but they were not fan friendly, especially when the crowds were small. Then the fans seemed to be lost in the space. They completed the renovations in time for the first Los Angeles Rams game of the 1980 season. The Rams played in Anaheim Stadium until they moved to St. Louis after the 1994 season. Due to the 1994 earthquake, the Sony Jumbotron collapsed onto the upper deck seats. Thankfully the stadium was empty so there were no injuries. They reinstalled the monitor directly on the back of the upper deck stands. The Walt Disney Company, a minority owner of the Angels since their inception, gained support from the board in 1996 to run the team. The Los Angeles Angels soon made a deal to stay in Anaheim until 2031, with an option to opt out after 2016. 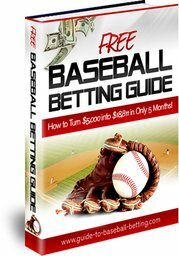 Part of this agreement included major renovations to the stadium and returning Anaheim Stadium to a baseball-only stadium. The renovations restored the view of the mountains as well. Edison International bought the naming rights to the stadium in 1998 for a 20-year period. They named it "Edison International Field of Anaheim." Edison backed out however after the 2003 season. 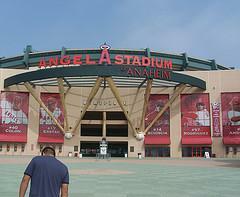 December 2003 the Angels announced the permanent name of the stadium as Angel Stadium of Anaheim. The field dimensions Angel Stadium of Anaheim are 330 feet down the left field line, 400 feet to center field, 330 feet down the right field line, and 60.5 feet to the backstop.